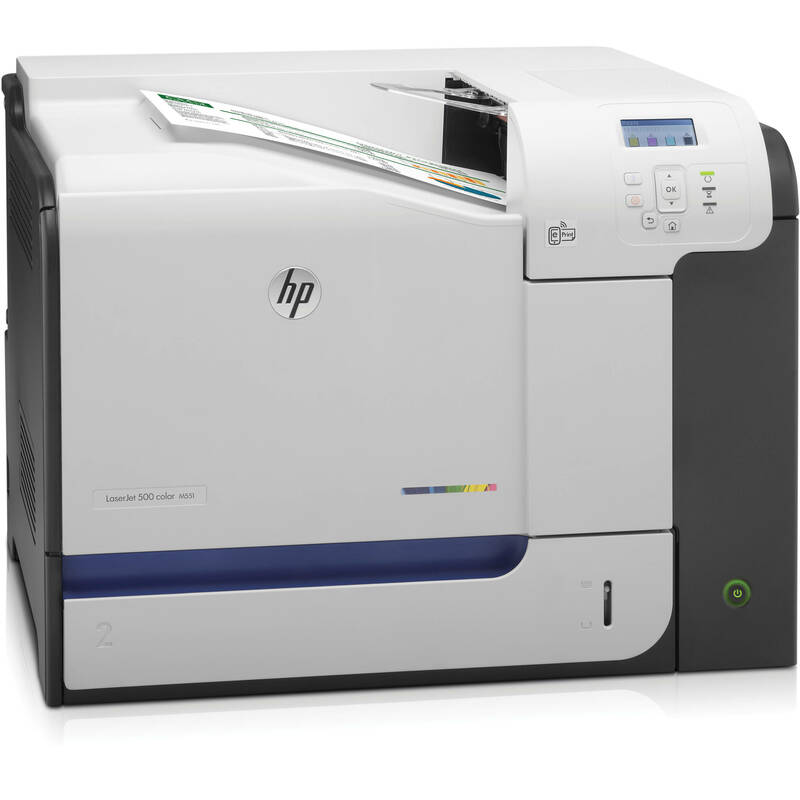 The LaserJet Enterprise 500 M551n Network Color Laser Printer from HP outputs up to 33 pages per minute in both black and color. The printer's high 1200 dpi resolution (black and color) and high monthly duty cycle (up to 75,000 pages) let you execute high volume print jobs in-house, saving the time and money of outsourcing print jobs. The printer features a 2-tray, 600-sheet total input capacity, allowing you to execute larger print jobs without stopping to reload. Having the second tray also provides the option of keeping a 2nd, commonly used media type such as labels or photo paper in the printer so you don't have to keep switching media. The printer's multiple connectivity options make it easy to get any print job done wherever you are. In addition to 2 standard USB ports, the printer features Ethernet connectivity and an embedded print server so you can easily share the printer with your entire team. Don't worry about keeping your data secure; the printer's built-in security measures ensure your proprietary data stays out of the wrong hands. Not an IT expert? HP's easy network setup guide leads you through the process of setting up, sharing, and securing your printer. Paper Sizes Tray 1 (Standard): Letter, Legal, Executive, Statement, Postcard (JIS), Double Postcard (JIS), 4.0 x 6.0", 3.0 x 5.0", 5.0 x 7.0", 5.0 x 8.0", 8.5 x 13.0"
Tray 2 (Standard): Letter, Executive, Statement, Double Postcard (JIS), 4.0 x 6.0", 5.0 x 7.0", 5.0 x 8.0"
Box Dimensions (LxWxH) 28.0 x 23.0 x 20.0"
LaserJet Enterprise 500 M551n Network Color Laser Printer is rated 4.3 out of 5 by 17. Rated 5 out of 5 by ProfessionalConsultant from Excellent Printer For the last five years, I've used an HP 3600n Color Laser Jet Printer and was very satisfied with it. I upgrade every few years just to keep current on technology features, and this is the best printer yet! It is very quiet compared to my previous printer, prints much faster, and has been failure free. Set-up with both a Windows 7 machine and a Windows 8 machine was effortless and immediate. Even my iPad finds it on my home network and prints to it without any set-up at all. The toners have more page printing capacity than my previous printer. The HP LaserJet Enterprise 500 color Printer M551n is definitely worth the upgrade. Rated 5 out of 5 by RIFTOX from A Great Printer After six years happily using an HP LaserJet Color 3550, I replaced it with this M551n printer. Set up of the printer was very easy and very quick. The CD that came with the printer provided the proper driver for my Windows 7 64 bit operating system. My computer immeditatley recognized it and away we began printing. It prints both black and color documents very quickly, holds lots of paper, and goes to sleep fairly quickly, at which time it is silent. After printing, it makes a few knocking sounds, then goes into a rest mode. The knocking is initially unsettling, but it doesn't seem to affect the quality of the print or the overall performance of the printer. I've had it for about three weeks and think it is a great printer. I would certainly recommend this printer to someone that wants trouble-free printing of both black and white and color documents. Rated 5 out of 5 by 4536 from a fast excellent color laser printer This printer is excellent. It installed cleanly without any issues as a network printer on windows 8.1 and mac 10.6.8 and 10.7. The enclosed software disk was not necessary. We use it to produce draft copies for some art projects as well as a general office printer. It is not a fine art photography printer, but for less demanding projects - collage, mixed media,etc it is often more than adequate and really fast. It has worked well on a variety of paper media. The standard windows 8.1 drivers seem to be slightly better than the ones which come with the Photoshop Version I am using (especially for customizing for odd dimensions of paper), but there may be better drivers available; I haven't checked. This evaluation is based on 3 weeks of working experience with this printer. Rated 5 out of 5 by Lee the mag guy from Great Printer and Great Service This is not my first transaction with B & H. Service has always been great and pricing is very competitive. I needed a printer replacement pronto and B & H made the buying process as easy as could be. HP Printers are all I use and mine broke down after 8 hard years of service. They offered the right product at the right price and it was here in 2 days with free shipping! This machine runs quieter, prints better and from what I was told, uses less toner which is a GOOD thing given cartridge costs. I look forward to doing business with B & H again. Rated 4 out of 5 by vjames from Good Machine Good machine, great color quality. Only problem is you have to manual turn paper for 2nd side printing, somehow miss that part on this printer and there is no changing it. Rated 5 out of 5 by Mark2 from Just what we wanted This printer is fast and has very good print quality. We use it regularly, but not constantly, to print file copies of color photographs and documents with our letterhead. This printer is a perfect balance of good speed and quality for a reasonable cost. Does the M551n support 2 sided documents? It has manual duplex only. It does not have auto duplex printing capabilities. What is the part number for a replacement transfer kit for the M551N printer?